Thus, upon fishing for the Kenny Bernstein interview; it was kinda sad to think that another legendary NHRA Team is closing its doors - following on the heels of Don “The Snake” Prudhomme’s shuttering back in 2010. Kenny Bernstein was always a BAD HOMBRE to Mwah - becoming the first National Hot Rod Association (NHRA) ‘Flopper (Funnycar) pilot to successfully cross-over and win the Top Fuel Dragster category; a feat he did twice, (1996, 2001) to go along with his four consecutive Top Fuel Funnycar titles. 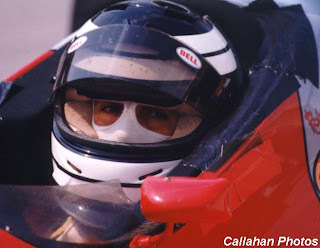 (1985-88) As Bernstein was also the first ‘Rail-driver to record an official NHRA pass breaking the 300mph barrier in 1992 and eclipsing this with the first 310mph blast in ‘94! Yet for me, I tend to remember Kenny B more as the frustrated(?) Back marker Championship auto Racing Teams (CART) Team Owner of King Motorsports, of which I thought their crowning achievement was Jimmy Crawford’s finishing 8th in 1991 at the Speedway, right? Although I’d forgotten that Roberto Guerrero captured the Pole at Indianapolis in 1992. Or that Scott “What Pace Car?” Goodyear won a race at Michigan in 1994; the team’s lone IndyCar victory. 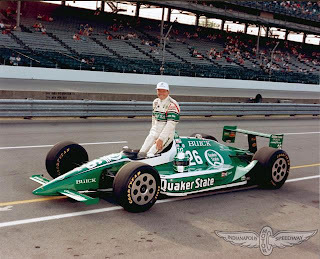 As I remember Bernstein’s CART Operation running in the colour scheme of green & white with primary sponsorship from Quaker State - with “The King of Speed’s” cars being predominantly powered by those OVER-boosted “Stock block” turbocharged Buick V-6’s. ..
As your humble scribe had been SUCKERED once again in the annual B-Squared I500 Pool; magik-IL-lee having drawn the very LAST starting spot (No. 33) which ironically, just so happened to be Scott Goodyear in the Walker Racing Mackenzie Financial Lola/Chevrolet - in which I, riding on the Coat-tails of thee ‘Kuhnadiun Goodyear almost pulled off the most unpredicted upset! The Perfect Storm - Really Indy Car? Sarah Fisher & Co making Big Offseason Moves! Austin F1 race is GO! Go Daddy - Make My Day! INDYCAR: Angstadt Out, Barnhart Emasculated!